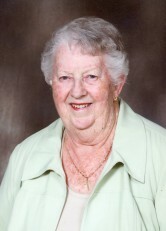 Passed away suddenly at Peterborough Regional Health Centre surrounded by her loving family in her 84th year. Daughter of the late Sarah Catherine McCulloch and John O'Brien of 6th. Kenyan, Greenfield, Ontario. Cherished wife of 54 years to Melvin Joseph McPhee (deceased 2011). Hilda leaves behind, to mourn this devastating loss, her beloved children Catherine Laura (Lee) Dickson, Mary Sandra Dee McPhee, Sheila Marie (Eric) Ainsworth, Allen Ian McPhee and Ewen Melvin (Lisa) McPhee. She will be terribly missed by her ten adoring grandchildren and will be super-duper missed by her three amazing great grandchildren. She will also be missed by her siblings: Donald Ranald (Rita May) O'Brien, Bernard (Ann) O'Brien, Bernice (John) Duggan, Alex O'Brien, twin sister Isabel (the late Billy) Henry, Betty (the late Frank) Travers and her sister-in-law Barb McPhee. Fondly remembered by many nieces, nephews, long-time friends and neighbors. Hilda and Mel loved to socialize and entertain with music and dance. She was a Highland dancer in her youth and they both continued to follow the Highland games throughout their lives. She was an inquisitive and adorable feisty fun loving soul, who loved to prove she could pull one over on us, especially when it came to playing cards. There was nothing better than to see the twinkle in her eye as she beat the pants off us, whether she cheated or not! Hilda spent many years canvassing for the Heart and Stroke Foundation. She was a member of the Catholic Women's League. She volunteered for decades at the Blood Donor Clinic, where she received a volunteer service award from the Canadian Blood Services. Visitation will be held on April 3rd from 2 to 4 pm and 6 to 8 pm at MacCoubrey Funeral Home in Cobourg. Mass of Christian Burial will be held April 4th at 10:30 am at St. Michael's Church in Cobourg followed by a reception at 11:30 am at the Columbus Community Centre (232 Spencer St. East Cobourg). Interment at St. Michael’s Cemetery will follow at a later date. In lieu of flowers, contributions may be made to the Kidney Foundation and the Canadian Cancer Society. Condolences may be offered at www.MacCoubrey.com. Wednesday April 3rd from 2 to 4 and 6 to 8 p.m.
Thursday April 4th at 10:30 a.m.